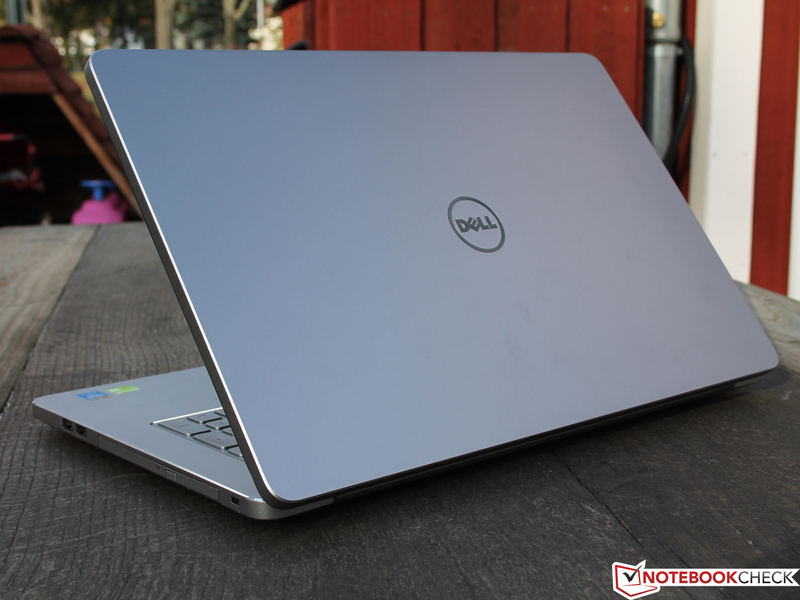 Dell's premium consumers are no longer equipped with just Haswell processors and potent graphics. Performance? Anyone can do that. Instead, the Texans are upgrading their optics, materials, and all-around workmanship. A successful combination of upscale packaging and lightning-fast innards? 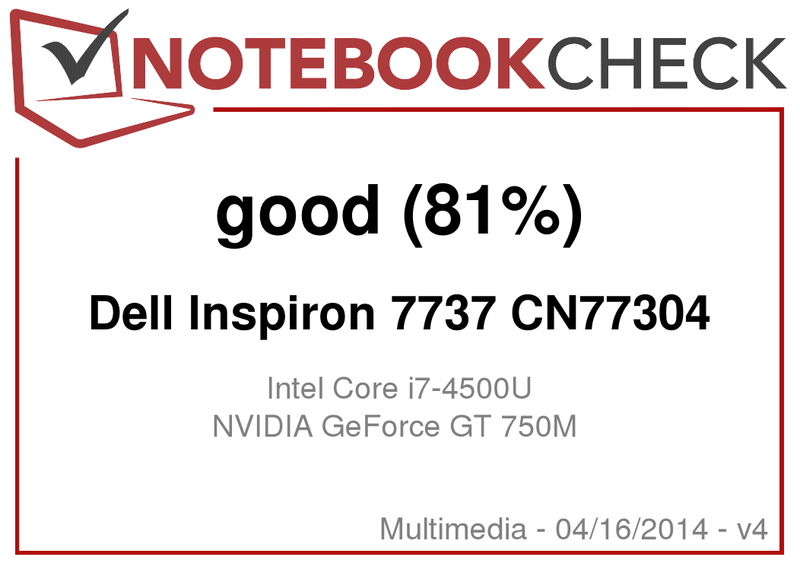 Dell Inspiron 7000-series 7737 CN77304: GT 750M, Core i7, and Touch-FHD - the all-around best among the multimedia laptops? Without great pomp or circumstance, Dell has announced a new era for its premium consumers with its Inspiron 7000-series. The models each sit in an aluminum case cast out of a single piece (including base and lid). But is such a top-of-the-line chassis worth the purchase price of 800 to 1,149 Euros (~$1070-1530, test configurations)? 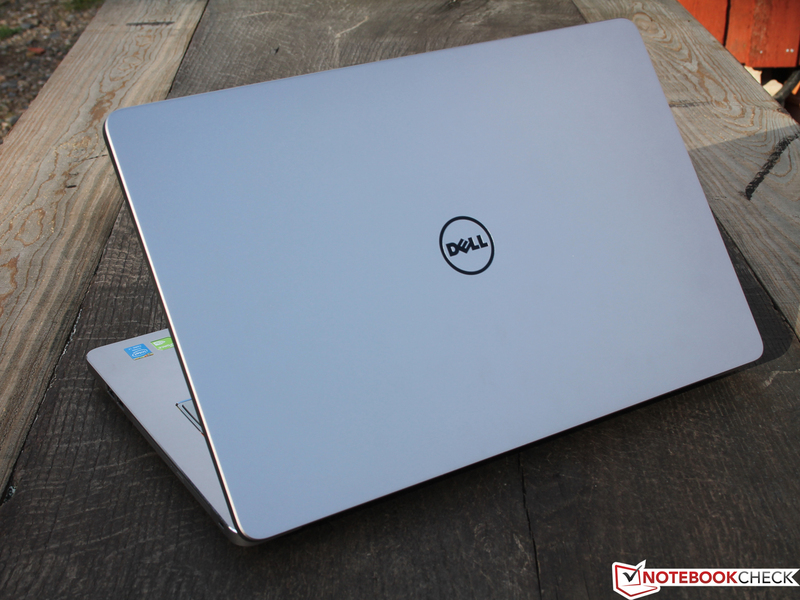 The 15-inch Inspiron 15-7537 already made a good impression in our tests -- how does it look for the current 17-inch model? 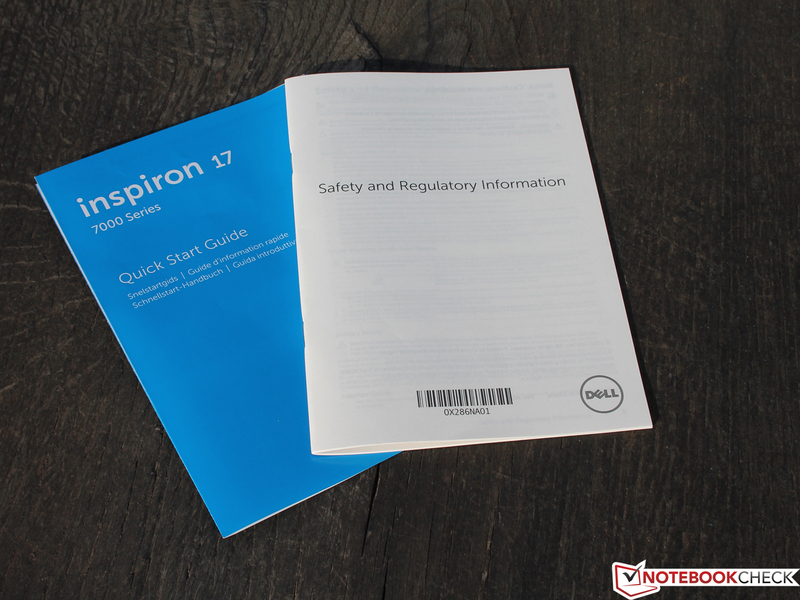 To place it properly in its market environment, we gathered three previous test products that lie around the Inspiron 17 (7737 CN77304) in terms of price. 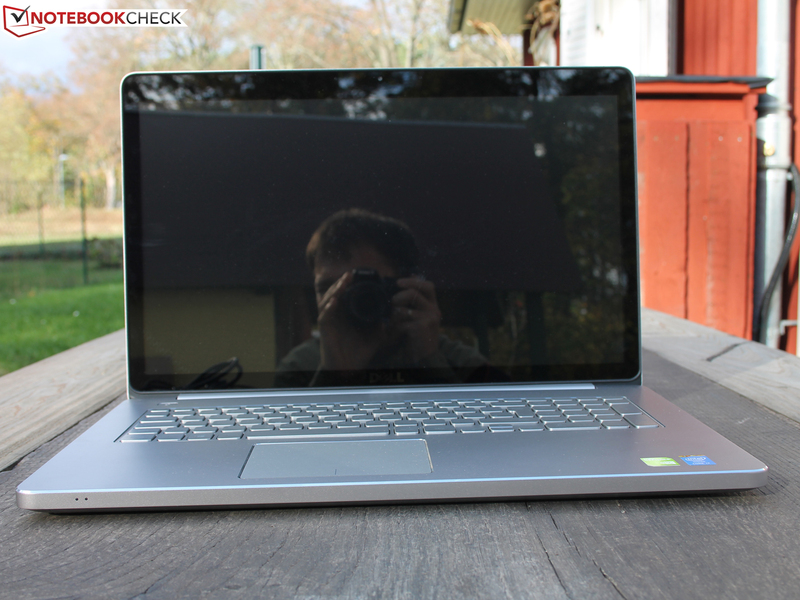 The Asus N750JV-T4110H (i7-4700HQ, GT 750M) for 1,300 Euros (~$1740) brings very impressive bodywork to the table; like the Toshiba Satellite S70-A-10F (i7-4700MQ, GT 740M), it's based on a standard voltage notebook processor. While Toshiba charges 1,130 Euros (~$1510), it looks like a bargain in comparison with the Acer Aspire V7-582PG-74508G52tkk (i7-4500U, GT 750M). 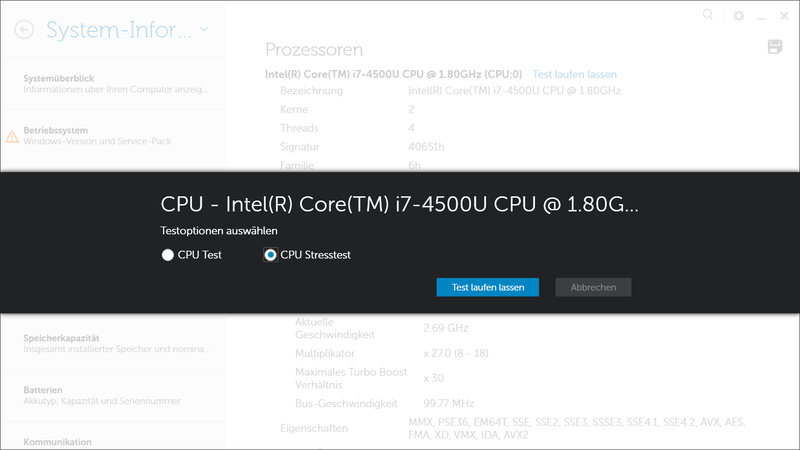 The same CPU-GPU combination costs "only" 1,000 Euros (~$1335) in our test product. 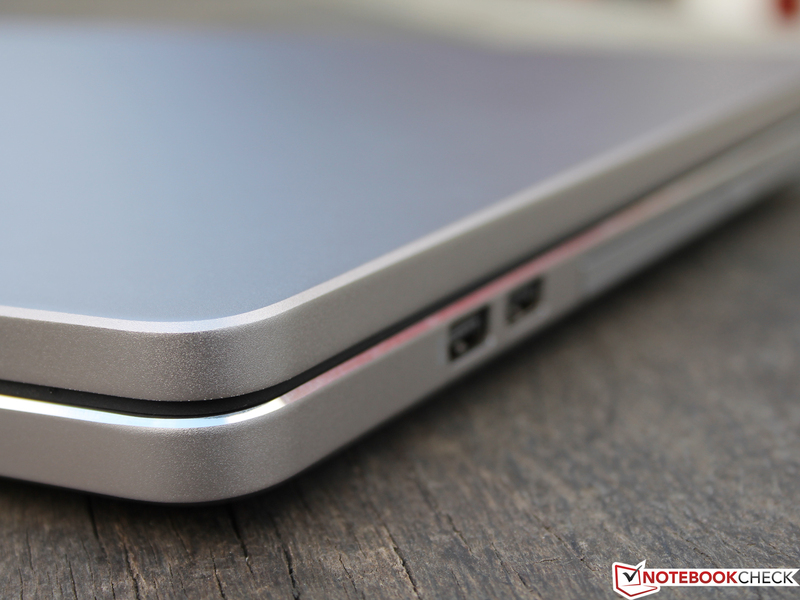 Premium construction: A laptop chassis is seldom both so hefty and so good-looking. ...only have access to the RAM, HDD, and battery. The lid, like the chassis, consists of one massive piece of aluminum. The edges were broken and polished to a high sheen, which leaves behind a very appealing impression. 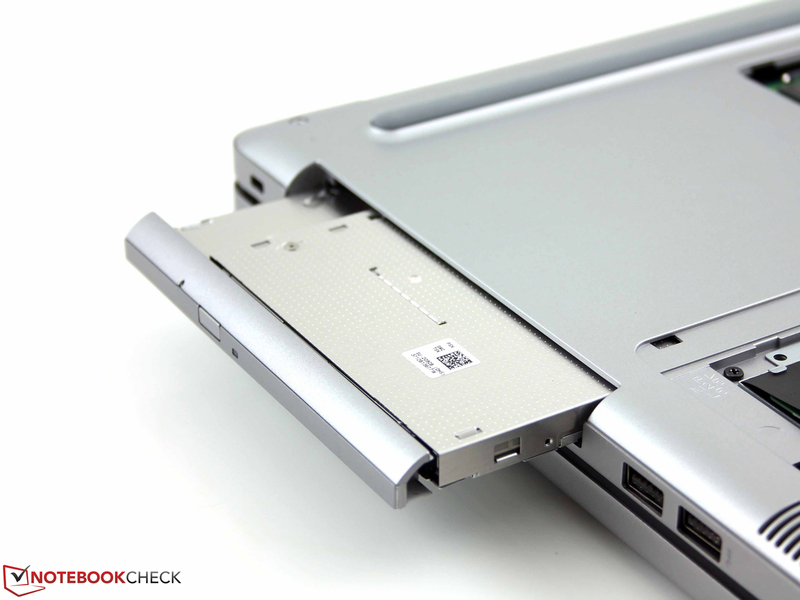 Dell decided on one continuous hinge, which is also composed of aluminum (at least the joint covering under it). It holds the lid firmly in position; in opening it, we actually had to hold the base firmly on the table. 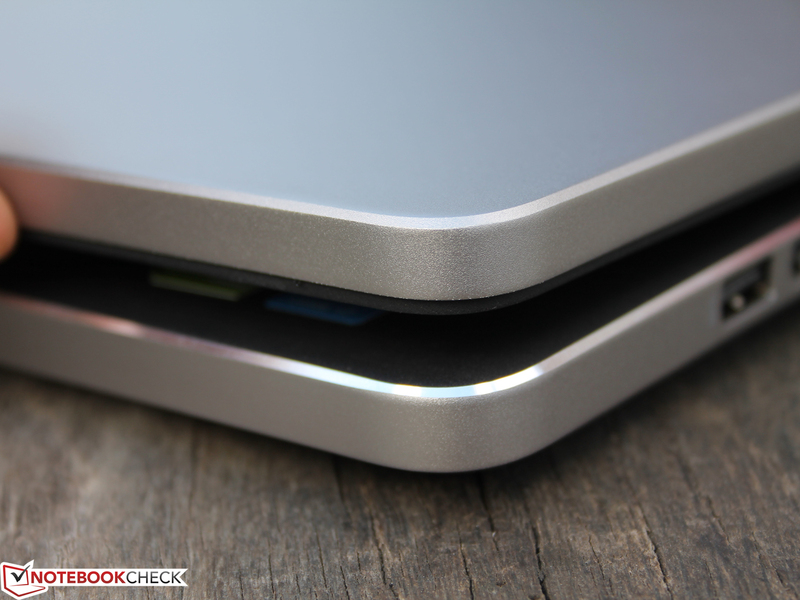 All of the aluminum surfaces are of anodized silver, so they are smooth, not brushed, and provide a good grip. The advantage of a polished/brushed finish: It does not leave any fingerprints behind. With the N750 (lid only), Satellite S70-A (inner surfaces, lid) and Aspire V7-582PG (inner surfaces, lid), finger smears are often visible. The stability of the 17-inch model goes hand in hand with its material. The chassis warps in one-handed use. With two hands, we could twist it markedly, so that we could see movement in the crevices on the underside. It is not the same with the lid, which is actually chiseled out of a single piece of aluminum. 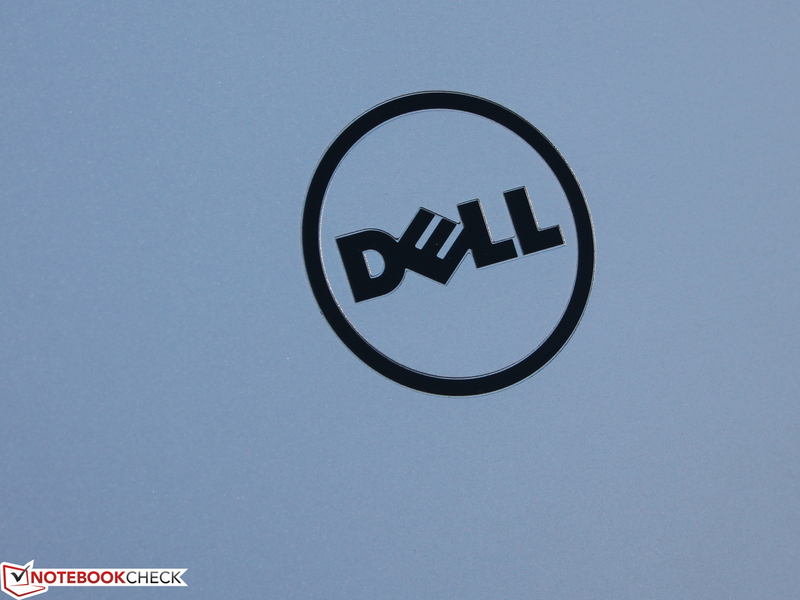 Even pressure on the middle (the Dell emblem) provokes no bowing, to say nothing of pressure on the panel. 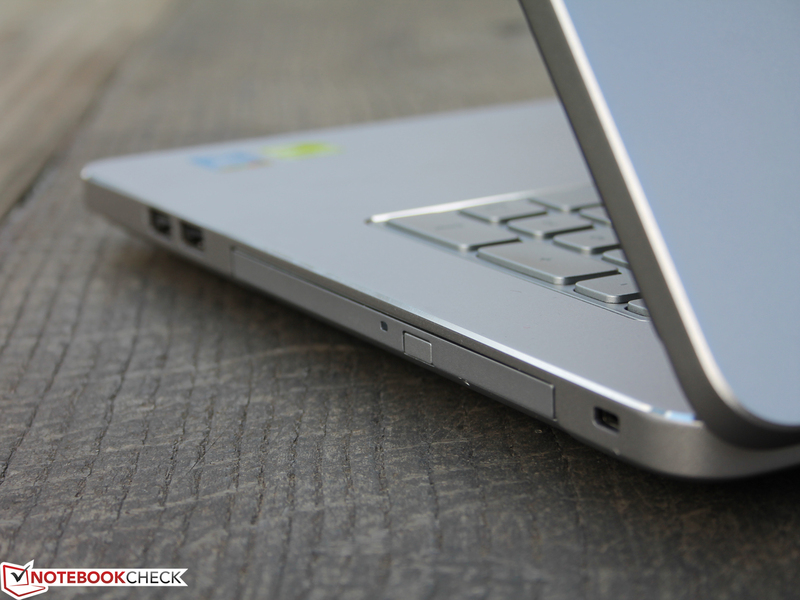 In terms of material, optics, and value, the Asus N750JV comes close to our Inspiron 17 (their workmanship ratings are almost identical). 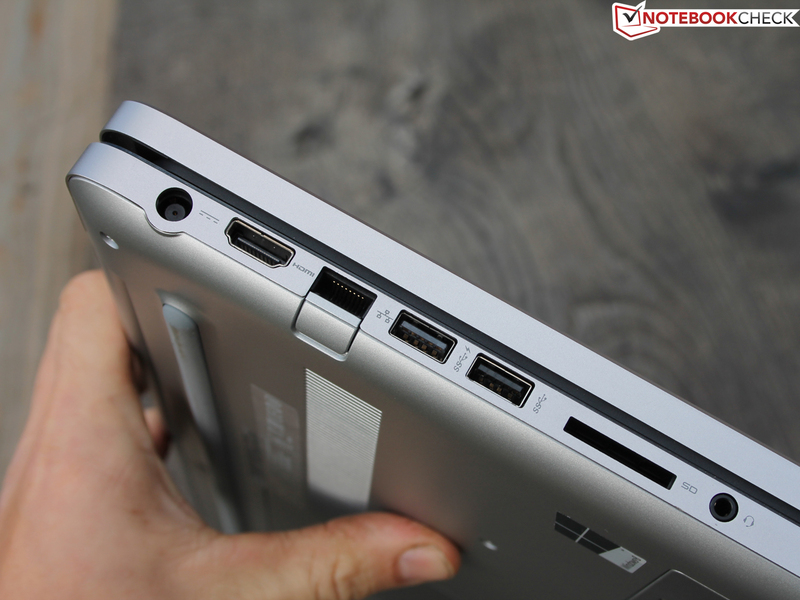 For a notebook of this size, the array of ports is a bit meager: They are the same as on the 15-inch Inspiron 15-7537. The layout of ports seems quite practical for desk use. 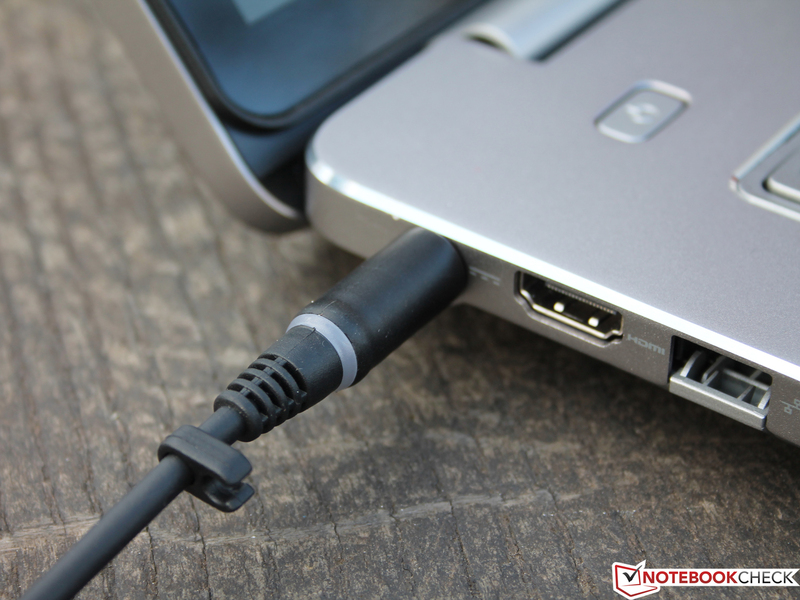 Cumbersome cables like HDMI, Ethernet, and USB 3.0 can be quickly passed backward. Ports on the rear side would have been more practical under the circumstances, but these only exist on a competing model, the Aspire V7-582PG (almost all on the rear side!). 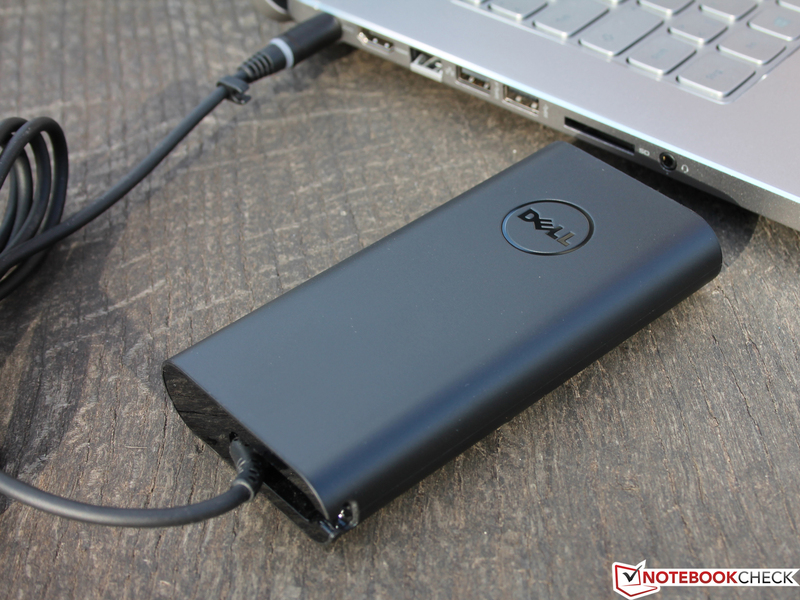 Under the circumstances, with Dell, we will have to grapple with the narrowly-placed USB ports; wide sticks or adapters (like the USB-eSATA-converter) could collide. Wireless connection is provided by Intel Wireless-N 7260, which connects with two antennae. 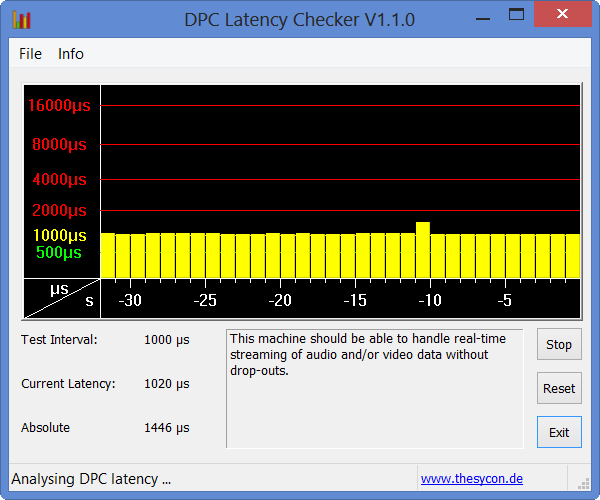 Apparently, the 7260 has a problem connecting over larger distances; just like with the Sony Vaio Pro 13 and the Lenovo IdeaPad U430p, our test product loses signal beyond 10 meters (~33 feet, measuring point outside the house; not a standardized test). At 3 and 10 meters from the router (~10 & 33 feet), the full reception strength is there. The poor wireless connection could come from the aluminum hull of the 7737. If the antennae are placed in the lid as usual, then they will be somewhat screened. However, with the above devices, the aluminum case does not become an issue. The GBE Family Controller from Realtek and the Bluetooth module complement the package. There is not much else in the box. Apart from the power adapter (90 W) there is just a warranty booklet and a how-to guide. Among the software, only McAfee LiveSafe and McAfee Anti-Theft are worth recommending, since they can each be tried out for 12 months. Windows media, as with most manufacturers, are no longer in the box. 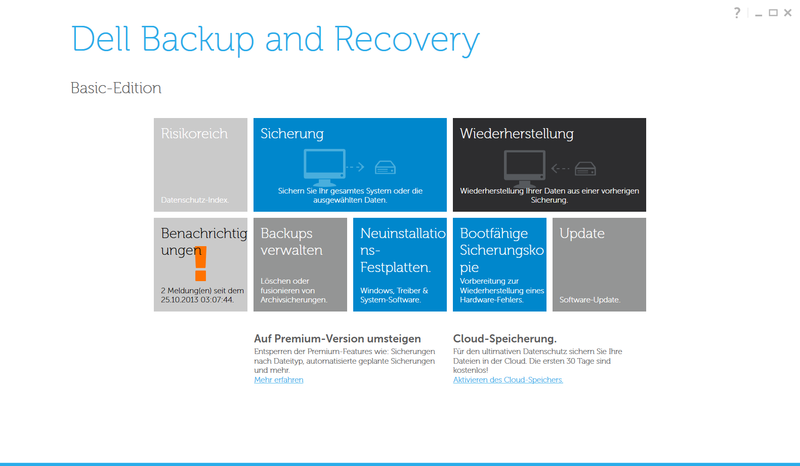 For their own security, owners should burn recovery DVDs with the Backup&Recovery Tool to insure themselves against possible hard drive malfunctions. Options for accessing the hardware seem limited upon the first look at the underside. 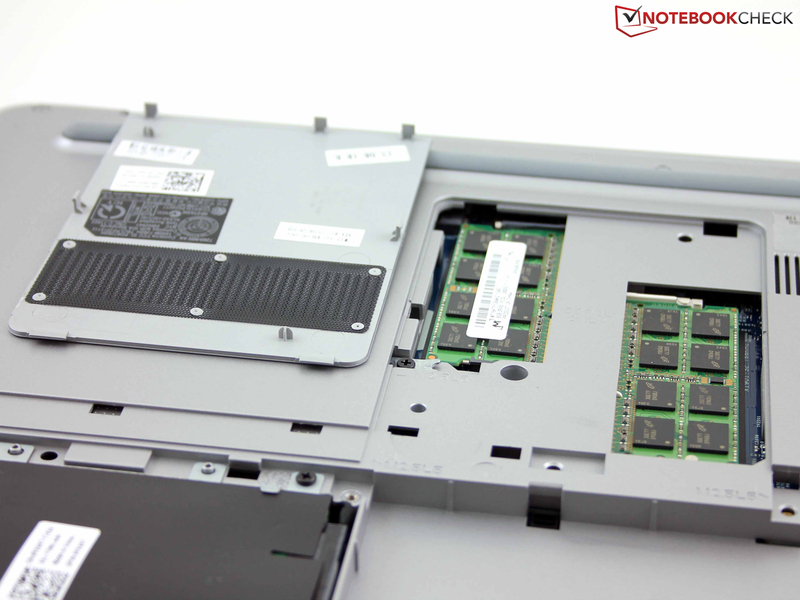 Only the battery, HDD, and two RAM modules are to be found under the main flap, but the fan and WLAN module are not placed on the outside. 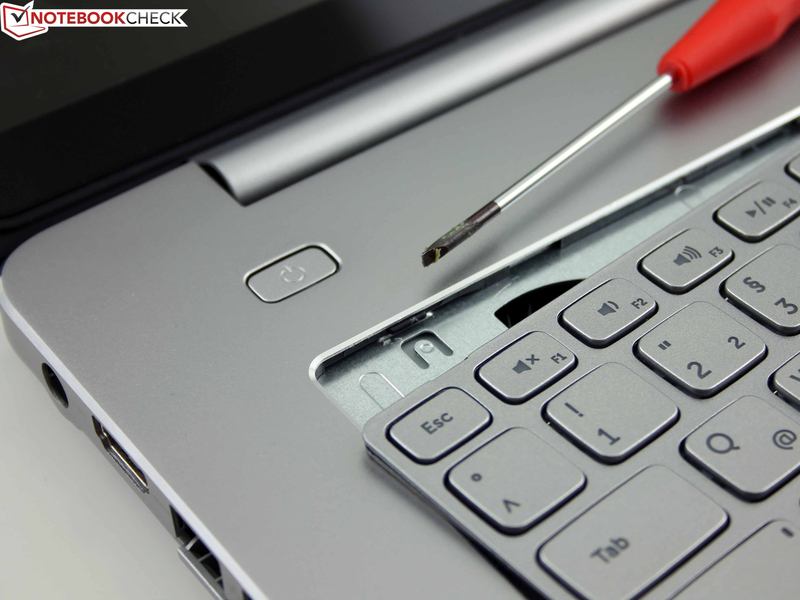 To access them, the keyboard must be carefully taken out, which is not exactly easy without scratching it. After prizing out three screws underneath the keyboard, the plastic underside can be taken out. Here, too, various latch mechanisms must be bypassed. The right column (image gallery) describes this process in detail. 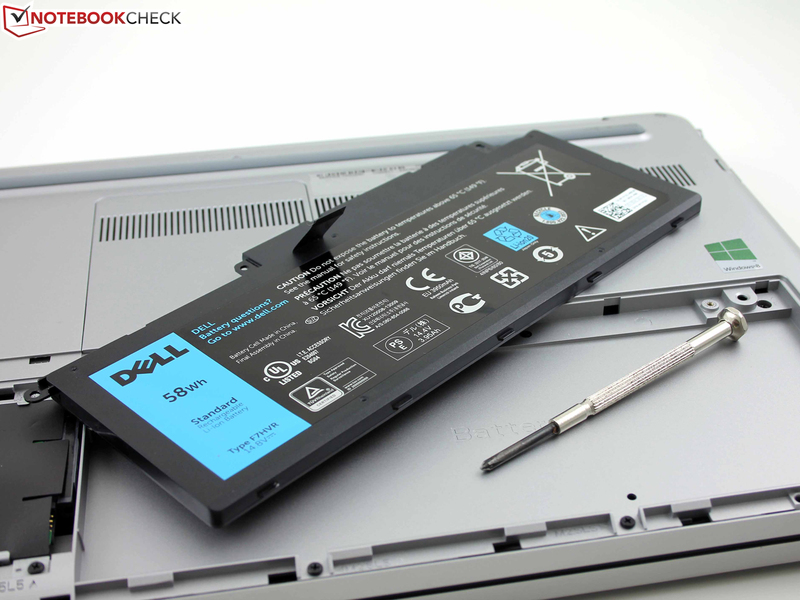 The 12-month warranty (Collect and Return Service) is typical for Dell. There are upgrade packages available, but the prices are hefty. This should be considered in comparison to the competition. An upgrade to two years of in-store service, for example, costs 129 Euros (~$175). 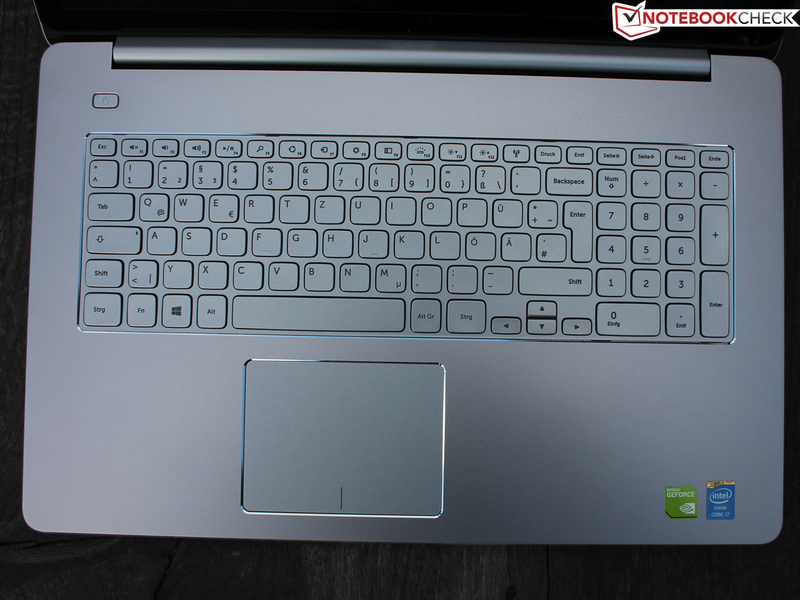 With the two competitors, Asus N750JV (Pickup & Return) and Acer Aspire V7-582PG, two years are built into the price. 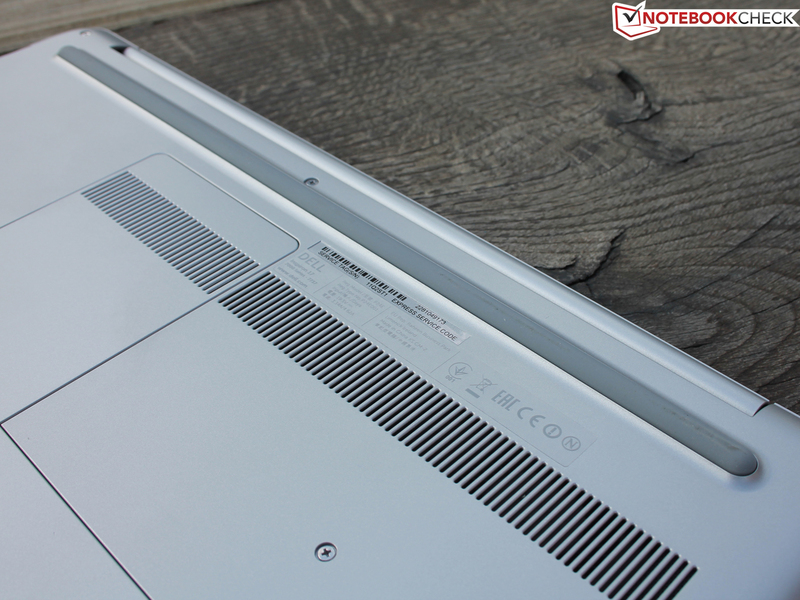 Toshiba Satellite S70-A-10F offers just one year. The HD camera is hardly suitable for a notebook in this price class, but the poor photo quality unfortunately matches the average of the webcams we tested. The images recorded (1280x720 pixels at most) rippled markedly, the colors came off as artificial, and the focus worked without problems only in the middle range. On the other hand, the array microphone (next to the webcam) makes good enough recordings. In the 17-inch model, this keyboard with individual keys benefits from a generous layout with offset arrow keys and a number pad in standard format. Still, users who write a lot will not love these keys. 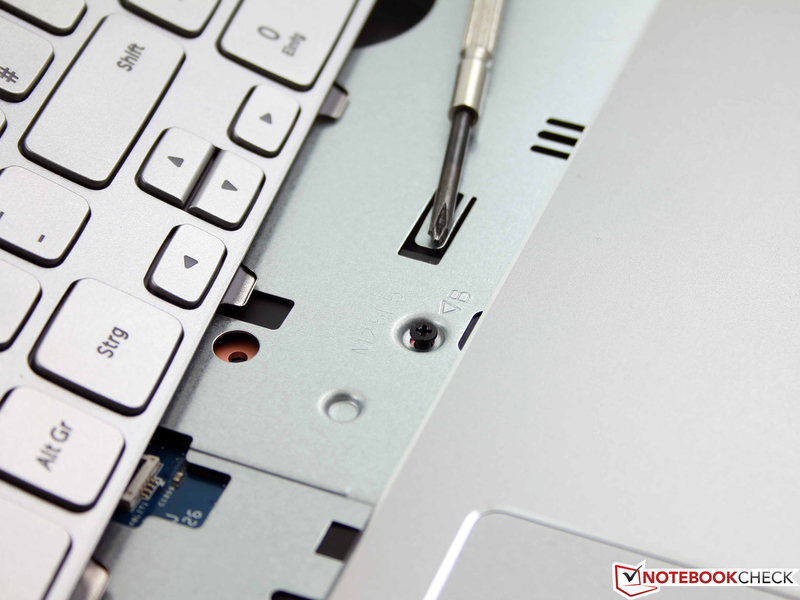 The reason: An indistinct pressure point and a flimsy push-back of the surfaces in the middle segment, which join the too-short stroke distance typical of laptops. The flat keys might otherwise be acceptable, since their upper surfaces are matte and their backlit illumination helps users avoid typos. We appreciate the touch pad more with its large, matte surface and the suitably large stroke distance. 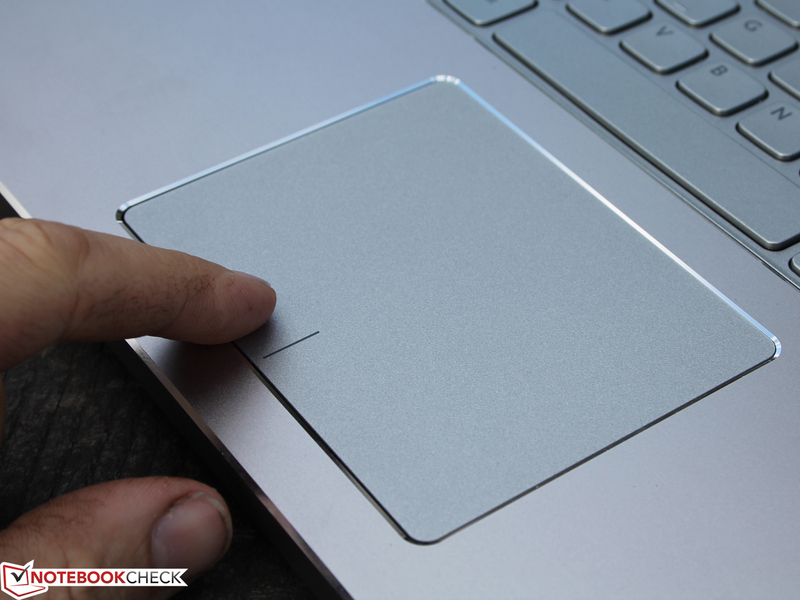 The ClickPad has two separate mouse buttons, but it also recognizes a mouse click with finger pressure on the ClickPad surface itself. 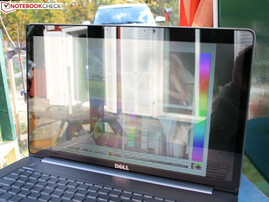 Dell forgoes the typical Edge-to-Edge design for its touch panel, in favor of a matte display. Whether the touch function will actually be used, is for the buyer to decide. However, the customer does not have the option not to buy it; the 7737 only comes with Touch (even in its optional HD+ resolution, at 1600x900 pixels). The surface, which recognizes up to 10 fingers, works swiftly, and the fingers leave relatively few marks on the smooth surface. There is a hard plastic pane in front of the panel, which protects the display from pressure points but also interprets finger position. 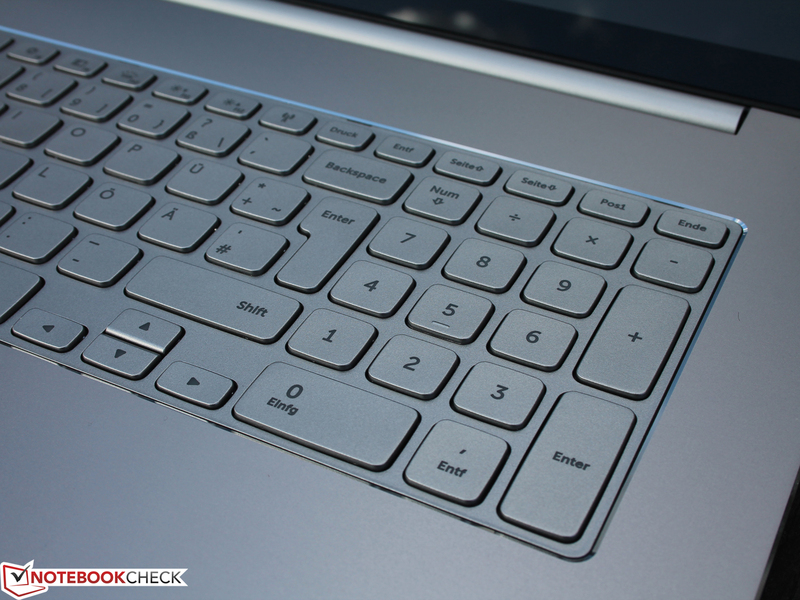 Keyboard: too little feedback for prolific typers, but with illumination, number pad, and a lot of space. 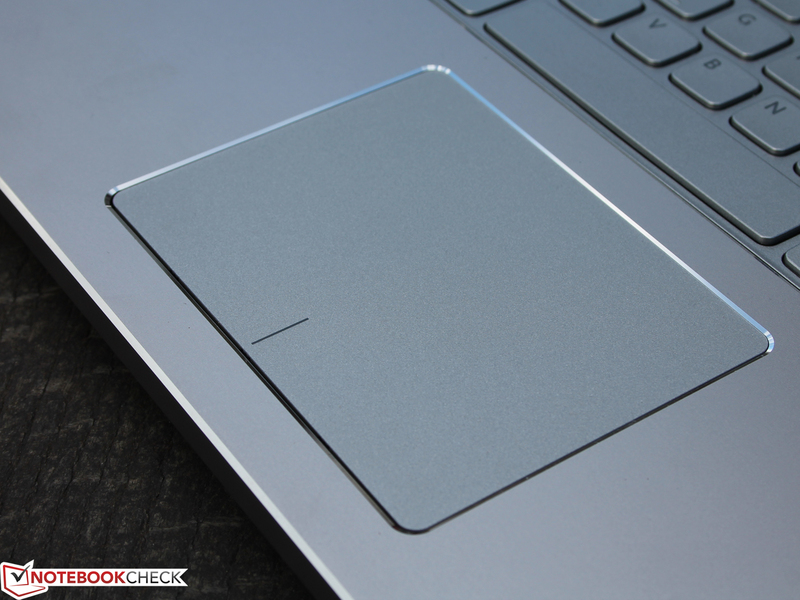 Click pad: certainly large, quiet, with acceptable feedback. The upper surface is fairly dull. Touch panel: Singleminded with quick reaction. No bending or bobbing of the lid during use. The 7737, equipped only with a touch panel, is sold by Dell in two versions: the HD+- (1600x900) and the Full HD version (1920x1080, test product CN77304). The W0D8C 173HGE panel, from manufacturer Chi Mei, is built according to TN Design (not IPS) but is a fine model. The high contrast of 1159:1 is, next to the strong brightness of up to 354 cd/m², a strength of the display that should be seriously considered. Colors appear crisp and fresh thanks to the minimal black level. Professionals generally consult the color space mask in order to make sure that colors are presented to the eye just as they are defined. Here the 7737 does not offer particularly high points but performs about as well as the usual TN panel. This is the report of our color space measurement (image row 1) and a test with the colorimeter (CalMAN image row). The absence of the sRGB-space is typical of TN displays -- even IPS is no better in this particular discipline (see image 4 ATIV 8 880Z5E). The Series 7 Chronos-770Z7E obviously has the same panel, which shows the identical color space (Chi Mei N173HGE-L11, CMO1720). However, CalMAN shows the following: the 7737 is less suitable for use outside the area of photo and image editing, since a strong blue tint (typical for TN) and a high DeltaE-variance of 10 create false colors. The human eye can only fail to notice the difference between reference colors (sRGB) and presented colors with a DeltaE smaller than 2.5 (screens: target vs. actual). Even the 15-inch sister model Inspiron 15-7537 cannot do this perfectly (DeltaE 6-7), although this model is equipped with an IPS panel (no blue tint). IPS panels are sometimes to be found among the competition (Acer V7, Asus N750), and the Asus N750 even boasts an anti-glare surface. In any case, with the N750 (non-touch) and the Aspire V7-582PG (touch) the contrast is only half as good. The IPS models have no blue tint; the TN displays of the Satellite-S70-A do. Outside the home or office, the 7737 offers less to be glad about. 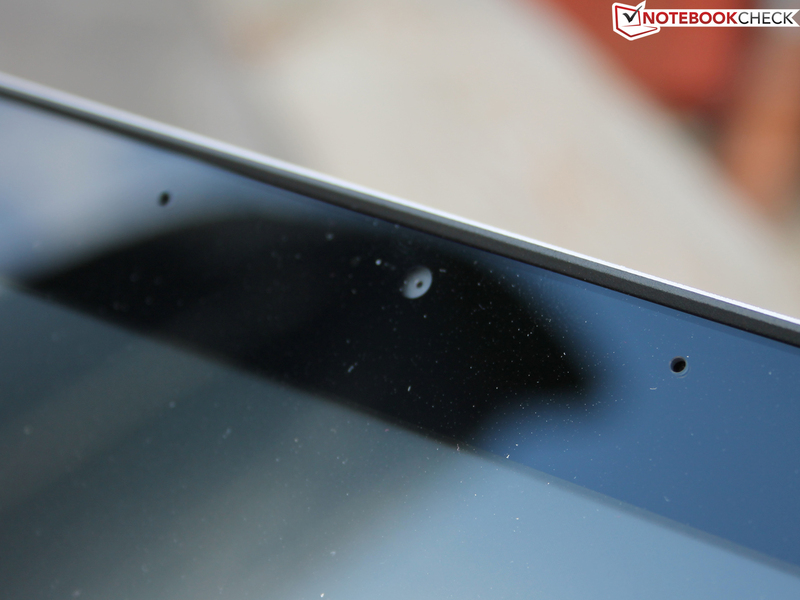 This is the fault of the strong reflection of the touch surface. As soon as the machine is in the shade, though, the high brightness and contrast make for an acceptable readability. For a TN panel, the observation angles are quite good. Above all, the presented image content stays stable for a relatively long time and presents only slight loss of brightness with horizontal viewing angle changes. At an angle of 40°, inclining the screen backward creates noticeable color inversions. Still, the display offers enough play space, even for multiple observers. 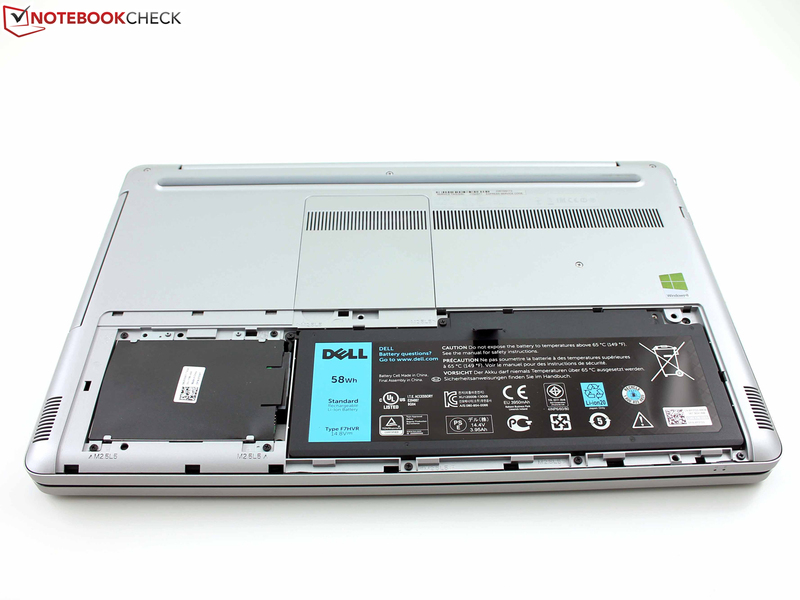 The Intel Core i7-4500U already played the main role in the Inspiron 15-7537. 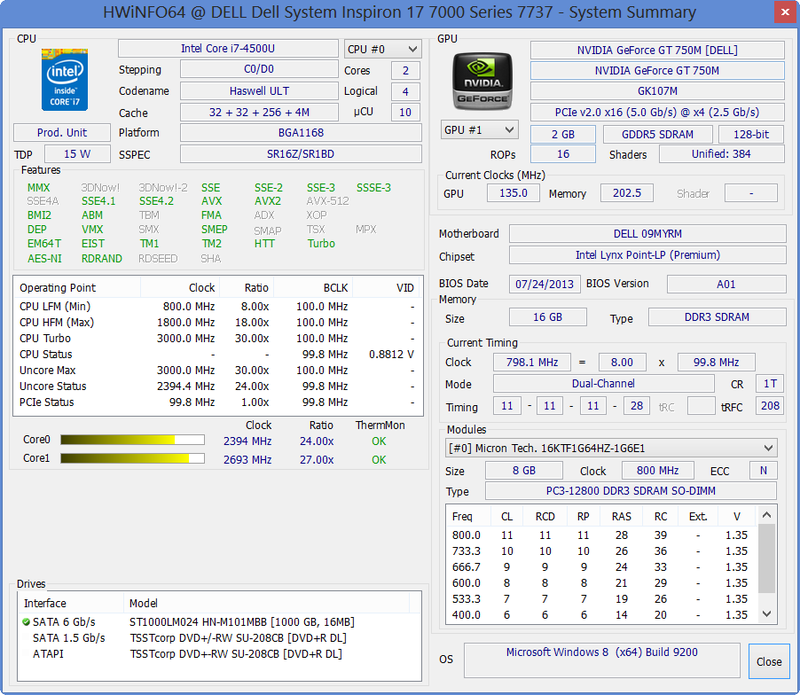 Next to the cheaper i5-4200U, it is Dell's only CPU alternative. Once again, it is noticeable: even in the large 17-inch model, the manufacturer chooses not to install the 47-Watt standard quad-core mobile processors (for example, Core i7-4700MQ), that Toshiba, for example, uses in its Satellite S70-A-10F. We will examine in the following sections whether this causes drawbacks in performance. 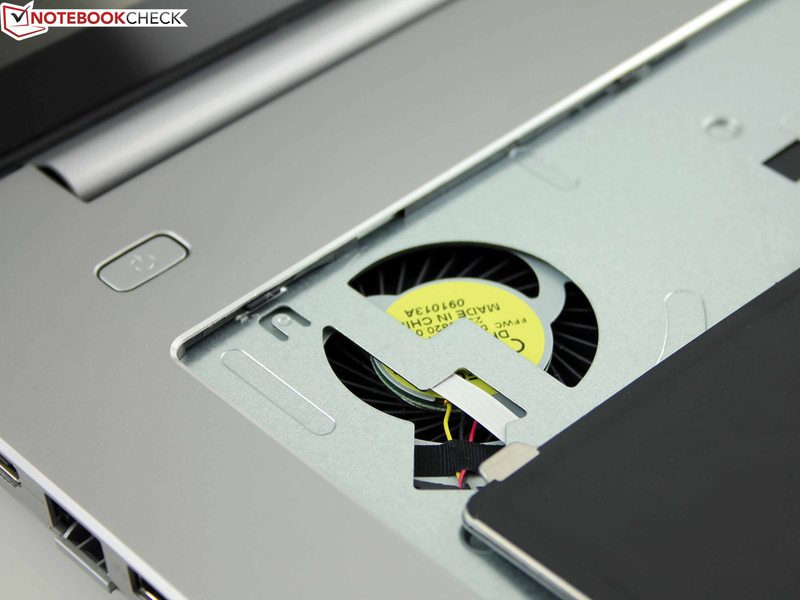 With two cores, the i7-4500U has a clock speed of 1.8 to 3.0 GHz (TDP 15 W) at its disposal. 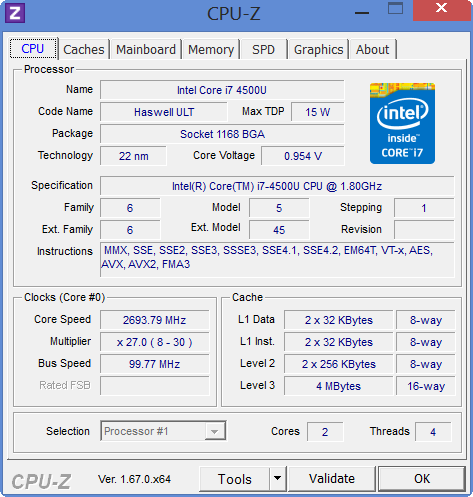 The Haswell CPU supports Hyperthreading, as well as the new AVX2 upgrade. Our data bank is ready for details like these and additional features. As a top-of-the-line-model, our Inspiron 17 comes out not only with an HD Graphics 4400 integrated in the processor, but also with a dedicated GeForce GT 750M. This card is in the upper middle-class lineup and should master most current games with no problem. The memory is especially generous: the manufacturer springs for an enormous 16 GB of RAM (two DIMMs, 2x 8 GB): still, this has no SSD, just 1,000 GB of hard drive space in the form of the Seagate Momentus SpinPoint M8 ST1000LM024. We will let the benchmarks wait for now and first look at the Turbo margins. 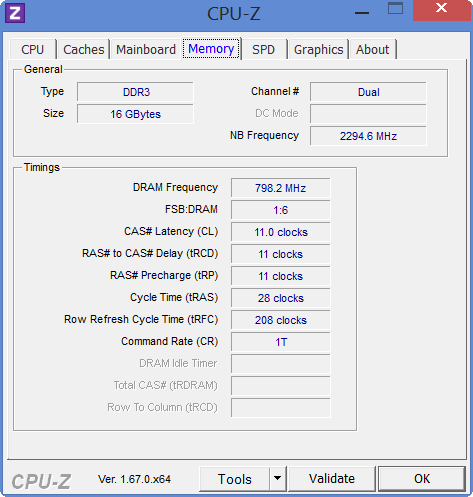 Single-core load runs at 2.7 GHz; Multi-core load has constant peaks up to 2.3 GHz. This is not exactly the 3.0-GHz Turbo (single) that was promised on paper, but it still clocks in at noticeably better than the normal frequency (1.8 GHz). We did not see the same decelerations that we observed in the Inspiron 15-7537 (with the same CPU) with Multithread at 1.8 to 1.9 GHz. 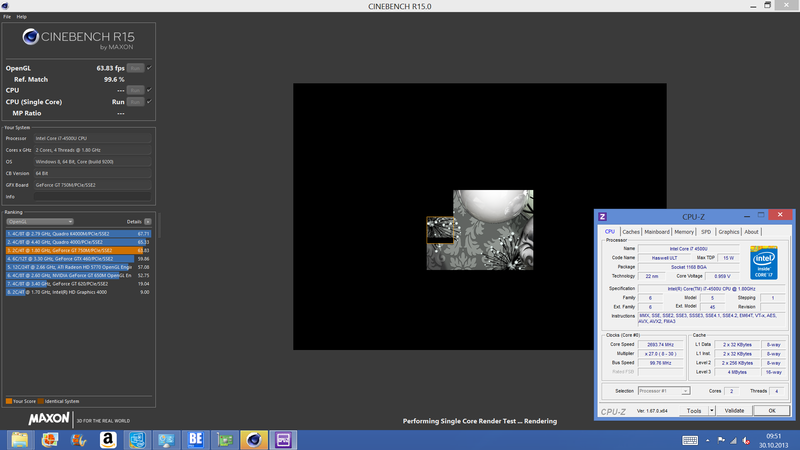 Incidentally, performance output remains constant while running on battery; all Cinebench R11.5 scores are identical in this mode (same with the OpenGL test with GT 750M). As for what this tells us about whether it makes sense to have a ULV-CPU in a 17-inch machine, we have to agree with the critiques of Performance Geeks. 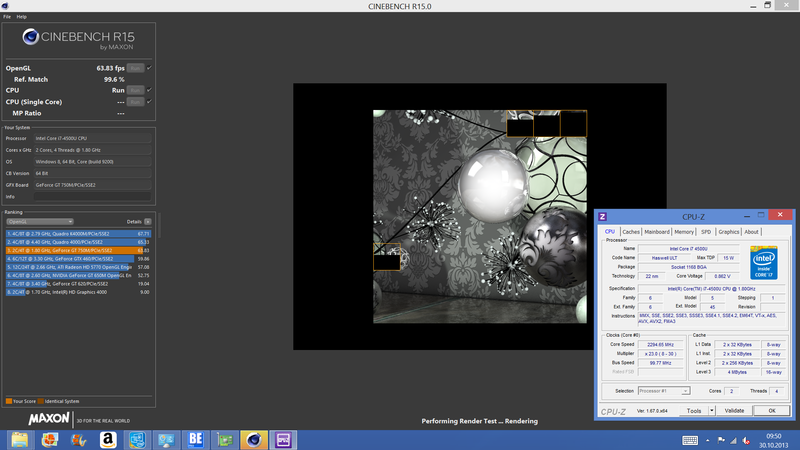 The Cinebench R11.5 shows an advantage of 90% (single-thread) to 230% (multithread) for the Core i7-4700MQ & Co. Since the corresponding competitors at the same price levels are equipped with a 47-Watt Haswell quad-core, buyers interested in performance should not have to take long to decide which competitor to purchase. In this comparison, AMD's Elite-APU A10-5750M performs surprisingly well, with its average performance just 10% poorer. Buyers who are disdainful of this manufacturer might be doing it an injustice. The HP Pavilion 17-e054sg costs just 600 Euros (~$800). How does application performance in the Form of PCMark, stack up in light of a moderately fast ULV quad-core? The 45- (Samsung 770Z7E-S01DE) and 47-Watt competitors sprint ahead, even though here the edge of 20 to almost 40% falls by the wayside. One exception: Acer's Aspire V7-582PG. 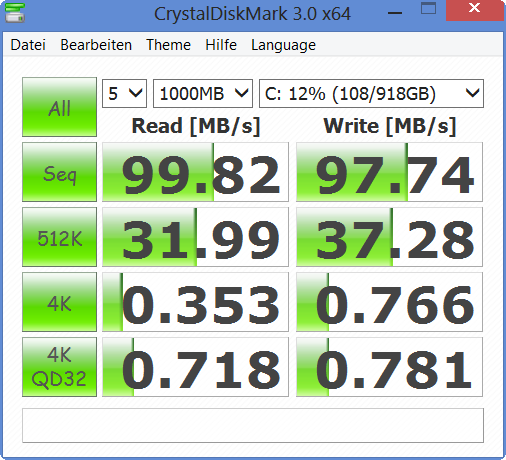 The reason is its 20-GB SSD cache, which results in very good System Storage Scores. 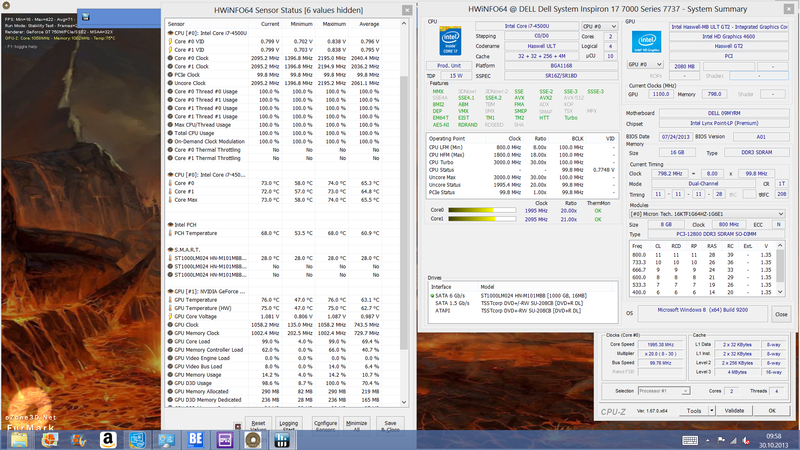 AMD also need not be humble in this area; the HP Pavilion 17-e054sg is just 22% slower than our 7737. The Seagate hard drive, with a total capacity of 1,000 GB, runs alongside most other rotating HDDs in terms of reading and writing efficiency, around the middle of the pack but slightly worse than average. We see this in the Pavilion 17 and the Asus N750JV, which perform an average of 36% better in Read 4k. 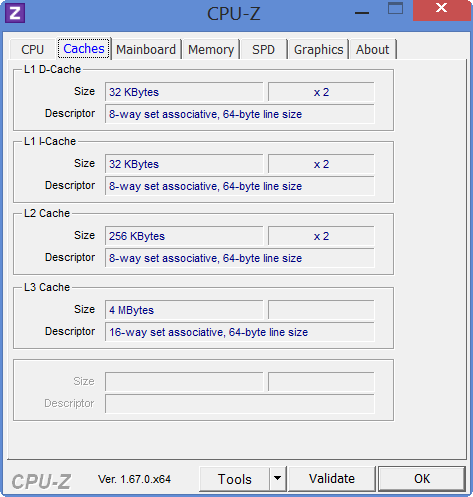 The Aspire V7-582PG cannot win any points with its SSD cache, and the HDD benchmark CrystalDiskMark 3.0 does not benefit from its faster buffer - but the user does profit from shorter system starts and load times. 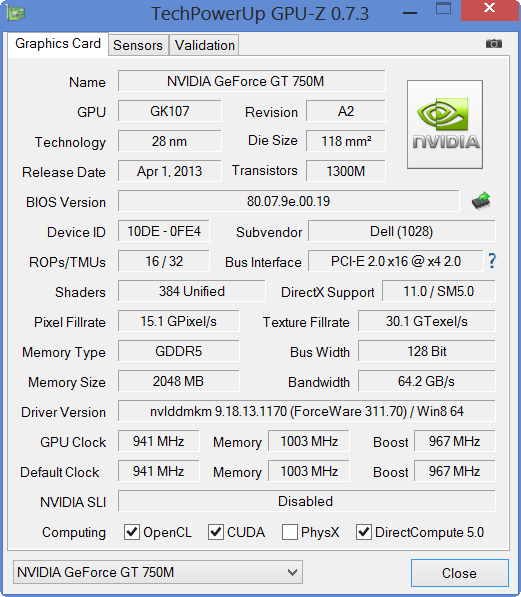 The GeForce GT 750M is an often used GPU and here it even comes with 2.048 MB GDDR5 of video memory. So that performance is not short-changed, there is also an Nvidia Boost, which runs at up to 1.058 MHz in the Dell - and that even under stress and during battery use (corresponding energy saver settings off). 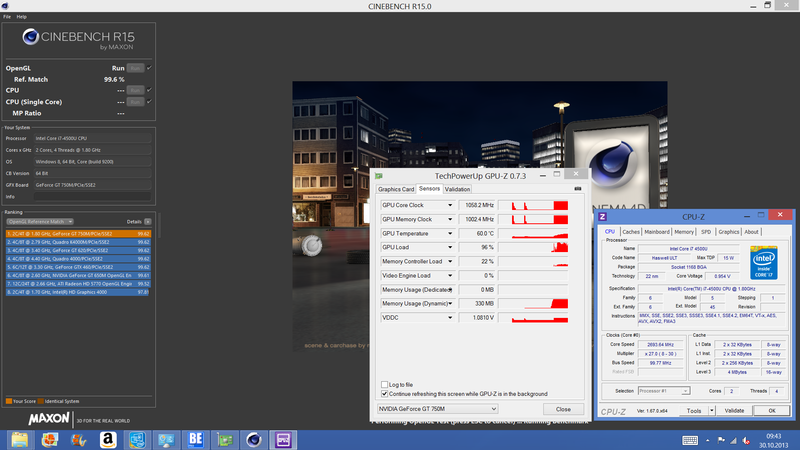 This is not the case with the Inspiron 15-7537 (stress test without GPU Turbo). Just as with the Render Test R11.5, the 3DMark 11 demonstrates the edge of the GT 750M (also compared to the GT 750M with DDR3) -- with just one exception. 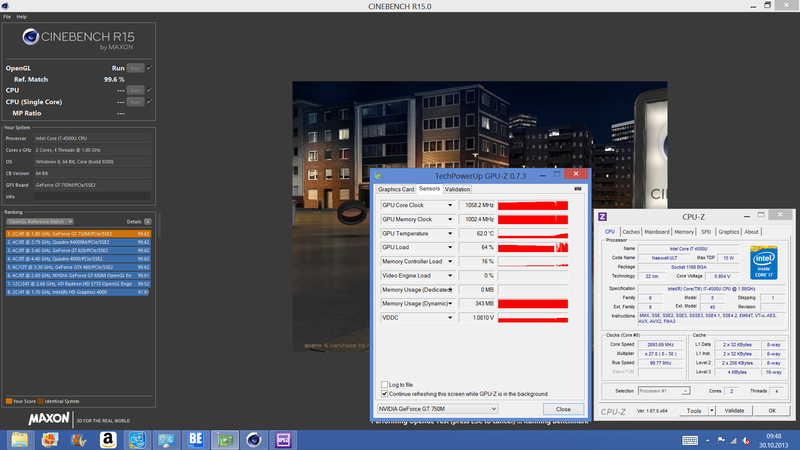 A GT 740M is beaten by 15% to 30%, and the GT 750 with DDR3 underperforms by 11% to 17% (only 3DMark 11). 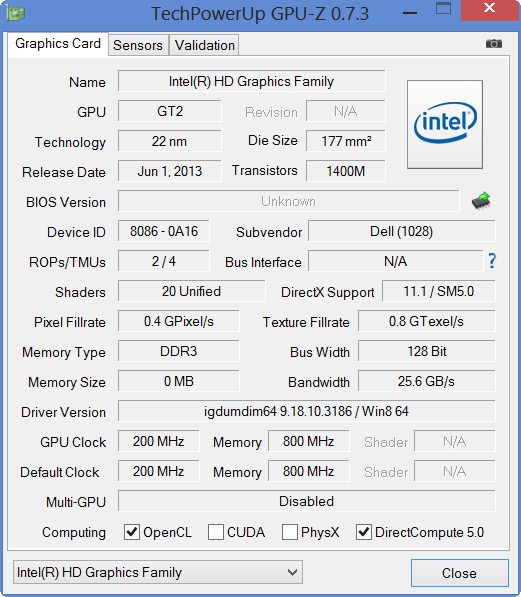 For general rendering performance, the graphics memory seems not to play a role. 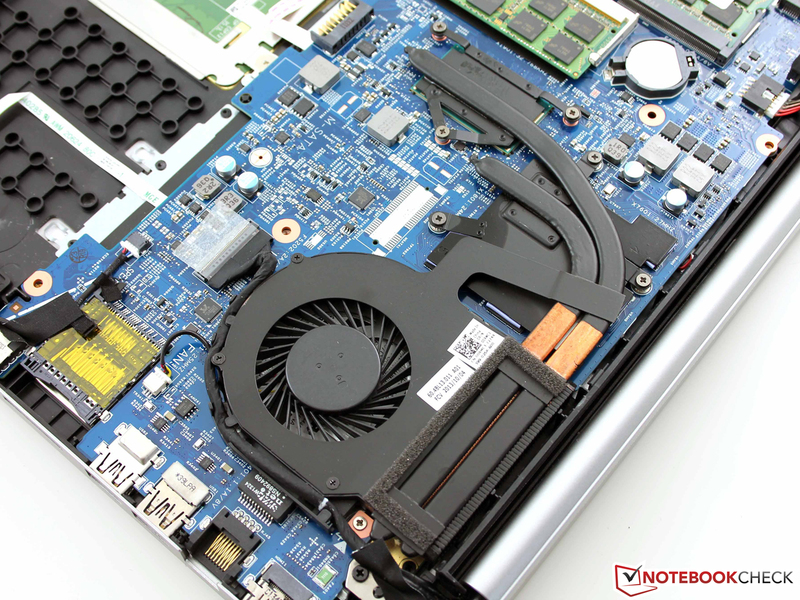 In our test of its sister model, the Inspiron 15-7537, we ran further benchmarks with the GeForce GT 750M. However, the games do not show the results that we wanted to see. 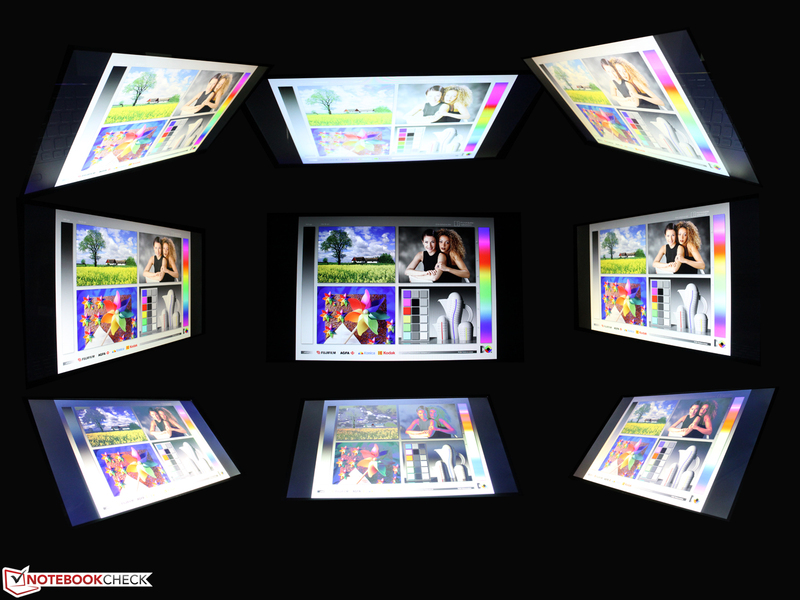 Images are rendered smoothly on the screen, mostly in high detail up to HD-resolution (1366x768). Still, there are exceptions like Hitman: Absolution and Company of Heroes 2. Here, the ULV CPU seems to limit the game from the first moment. If we look at other laptops with the GT 750M (even DDR3) and i7-4500U, we often find better frame rates (for example, the Aspire V7-582PG-74508G52tkk; ForceWare 311.41). We used the delivered ForceWare 311.70. During our gaming tests, the Intel HD 4400 was not active, and we examined the activity of the GT 750M with the NVGPU State Viewer. Again, the frame rates for an HD 4400 are too weak for this. The position of the K56-3F (47-Watt quad-core, GT 750M DDR3) can answer the question of whether games are limited by the ULV CPU. 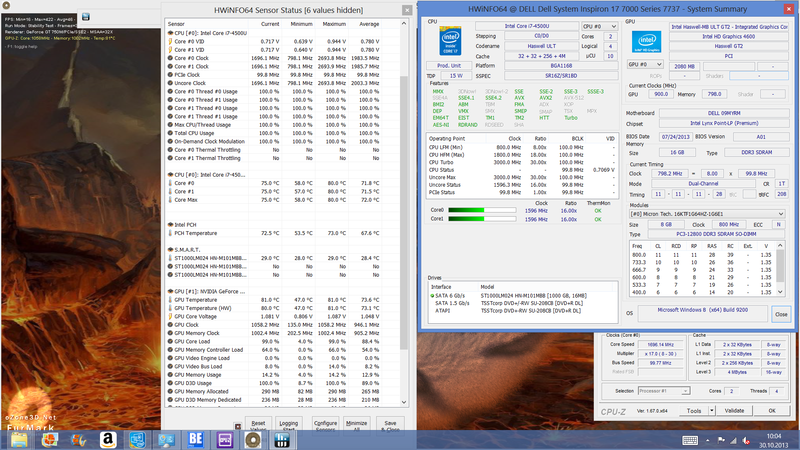 The One K56-3F is 26% (CoH2) and 100% (Hitman) faster than our test product with new drivers and GDDR5 memory. This effect does not show up in all games, as the comparison with Sleeping Dogs shows. The 15-Watt quad-core certainly has the advantage in its minimal emissions. Or does it? Toshiba's Satellite S70-A-10F (TDP 47 Watts) is a touch quieter in our stress test (-7%) and somewhat louder under simple load. Asus N750JV-T4110H and Samsung 770Z7E-S01DE hover respectively at the level of approximately 39 to 44 dB(A). This picture repeats itself while at rest, where the competition remains at 32 to 33 dB(A). The use of a powerful quad-core has no negative influence on the volume. 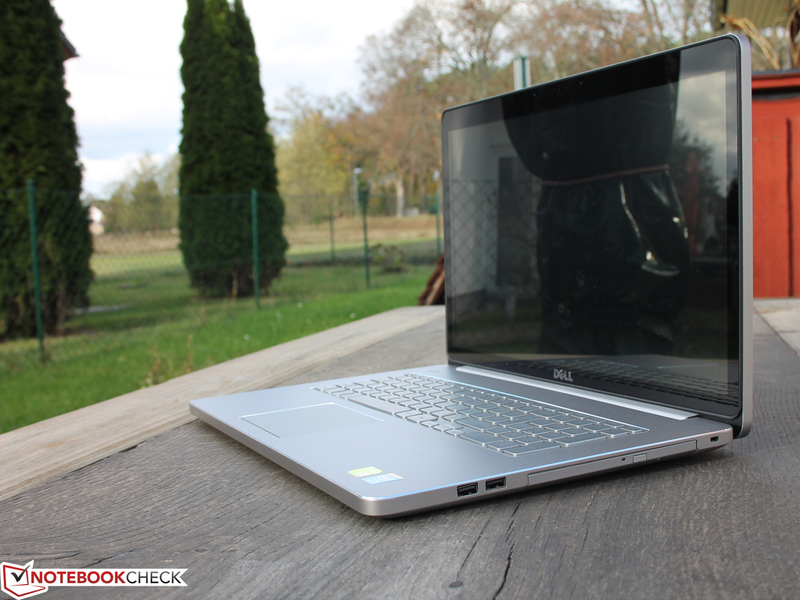 Things look different when we consider temperature - not to the advantage, but to the disadvantage of our Inspiron 7737. The competitors are cooler overall, whether under stress or at rest. We measure an average temperature of only 38 degrees Celsius (100.4 degrees Fahrenheit, stress), though this can quickly rise to 52° to 55 °C (125.6 to 131 °F, stress). At rest or under very minor load, the temperatures sit at a very comfortable level of at most 30 °C (86 °F) on the upper surface (average). On both the top and bottom, the distribution of temperature is recognizably uniform. 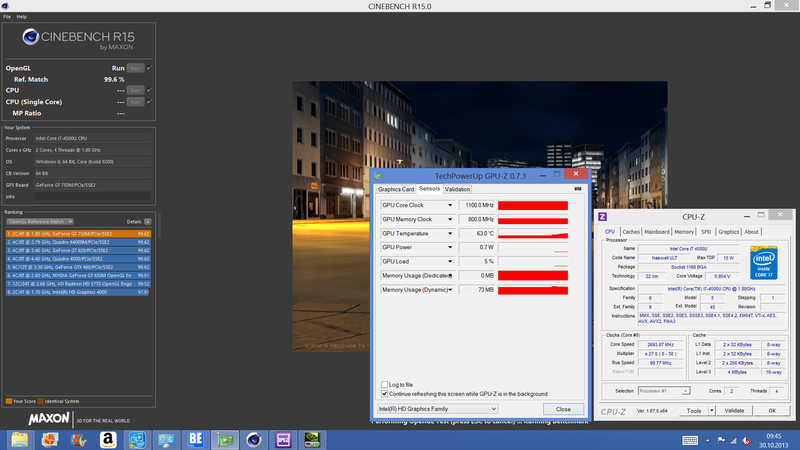 The CPU and GPU pass the stress test with almost consistent performance. 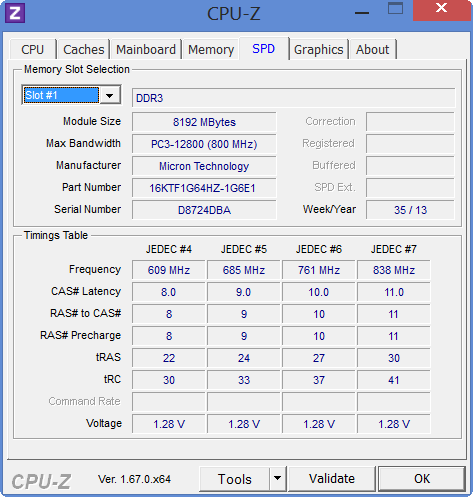 The GT 750M works steadily at 1,058 MHz (consistent); the CPU fluctuates between 1.6 and 2.1 GHz. The CPU's frequency control seems to us somewhat better than that of the Inspiron 15-7537, which might be down to its larger chassis (better cooling performance). 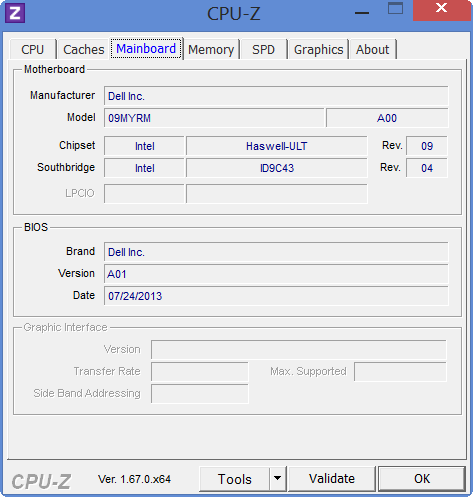 Apart from that, Dell has offered its own detailed stress test for the CPU (MyDell Tools). This runs for about 20 minutes; at the end, it offers the simple conclusion that everything is OK.
(-) The average temperature for the upper side under maximal load is 38.2 °C / 101 F, compared to the average of 30.9 °C / 88 F for the devices in the class Multimedia. (-) The maximum temperature on the upper side is 52.6 °C / 127 F, compared to the average of 36.5 °C / 98 F, ranging from 21.1 to 71 °C for the class Multimedia. (±) The average temperature of the palmrest area of similar devices was 29.1 °C / 84.4 F (-0.4 °C / -0.7 F). The 7737 has its stereo speakers, which play downwards, in common with the 7537 (15-inch). Clear high points such as a clear bass (for a notebook, at least) as well as the high maximum volume make external speakers superfluous in many cases. Users who prefer to attach headphones or an additional amplifier can use either the analog jack (3.5 mm) or the digital HDMI port. The Haswell-ULV platform shines with its possibly record-breakingly-low consumption levels. In idle use, the minimal energy requirements of our 17-inch model lie at just 5.2 to 16 Watts. The maximum idle level is so high because of the high illumination of the panel. In comparison with the competition, the 7737 performs very well indeed: one of the most thrifty 17-inch multimedia products sits before us. 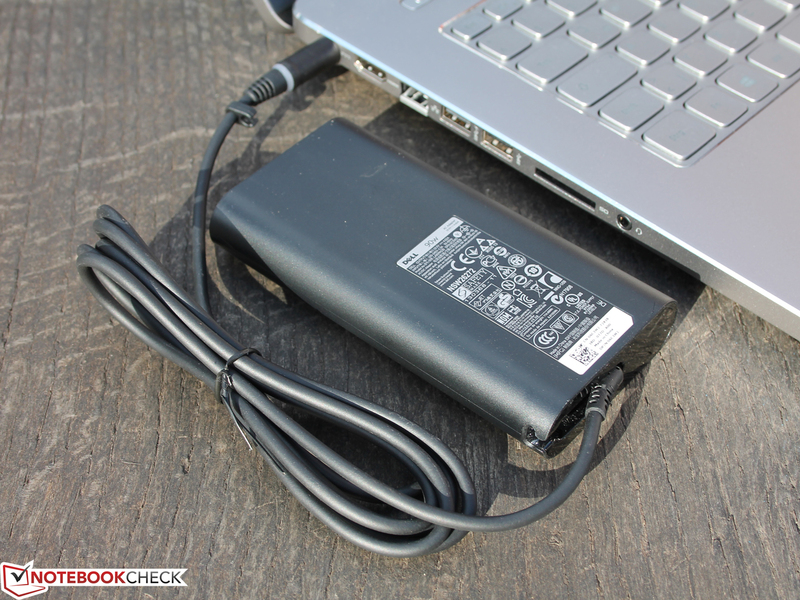 Hot on its heels: Toshiba's Satellite S70-A-10F (6-15 Watts). In comparison, Asus' N750JV-T4110H (9-18 Watts) and Samsung's 770Z7E-S01DE (14-26 Watts) look like energy dinosaurs from eons gone by. As can be expected, power consumption increases markedly under load, but it stays (at 62 to 72 Watts) noticeably under what the 47-Watt competition (N750 at 80 Watts, Satellite S70-A at 107 Watts) draws from the socket. Here a lot depends on how well the notebooks use their Turbo bandwidth - and the Satellite S70-A does it best. 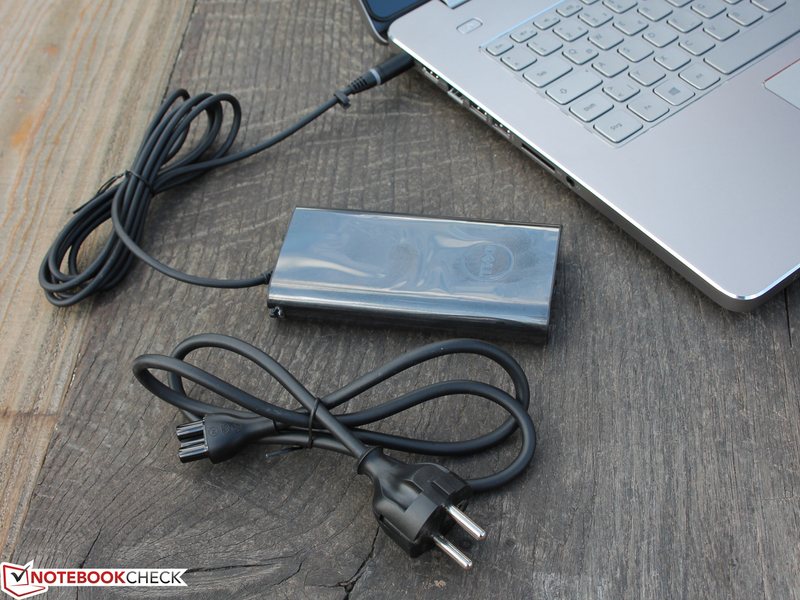 The included 90-Watt power cord offers more than sufficient performance reserves. Last Battery Eater Classic: 121 min. DVD playback, max. brightness: 190 min. 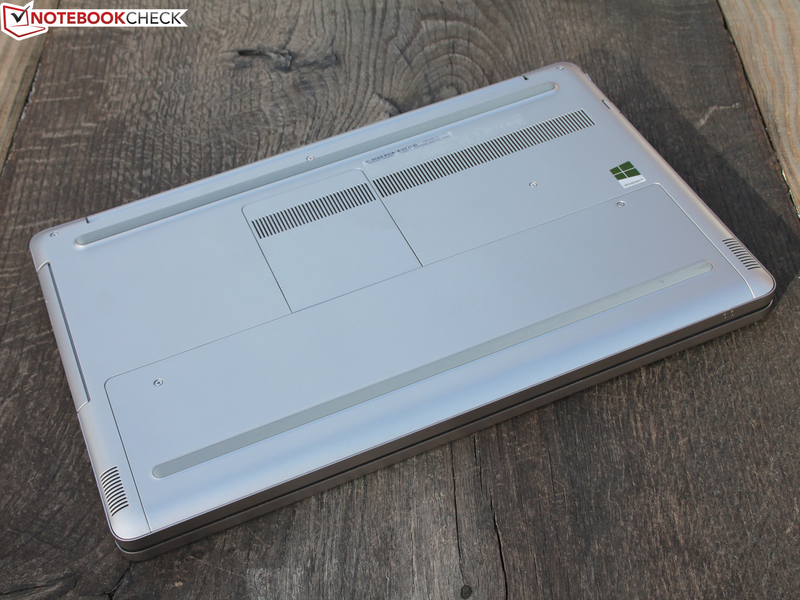 Toshiba's Satellite S70-A-10F (48 Wh) may seem like the strongest competitor for performance (CPU), but it is also the competitor with the shortest run times. It manages only half the time of our 7737 (WLAN Test 6 hours, 25 minutes). This is partly down to its capacity; our test product brings 58 Watt-hours to the table. 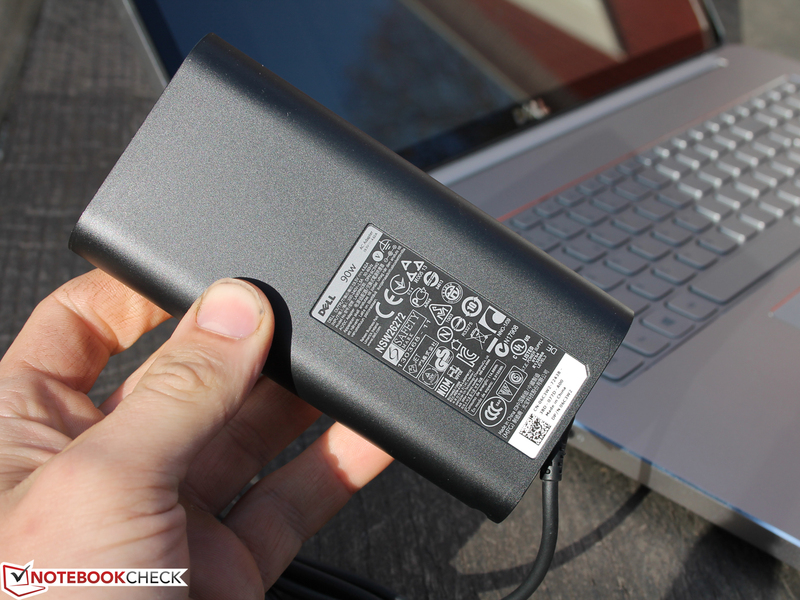 The Asus N750 (70 Wh) and Acer's Aspire V7-582PG (53 Wh) are not too far behind; they perform neck and neck with each other, at about 4 hours, 30 minutes. The low-voltage CPU demonstrates its worth in our run time test under load; here it outpaces the Satellite S70-A-10F by 64%. This time, we made us of the Battery Eater Classic Test, which renders a graphic. The whole is more than the sum of its parts. Dell proves it has a knack for combining state-of-the-art multimedia hardware with a visually pleasing, top-of-the-line chassis. Customers should have no problem putting this model up on the table, since it is both distinguished and fit for daily work. The 7737 does everything right as far as desk placement; the sufficiently cool and fingerprint-free case cuts a fine figure under one's hands. 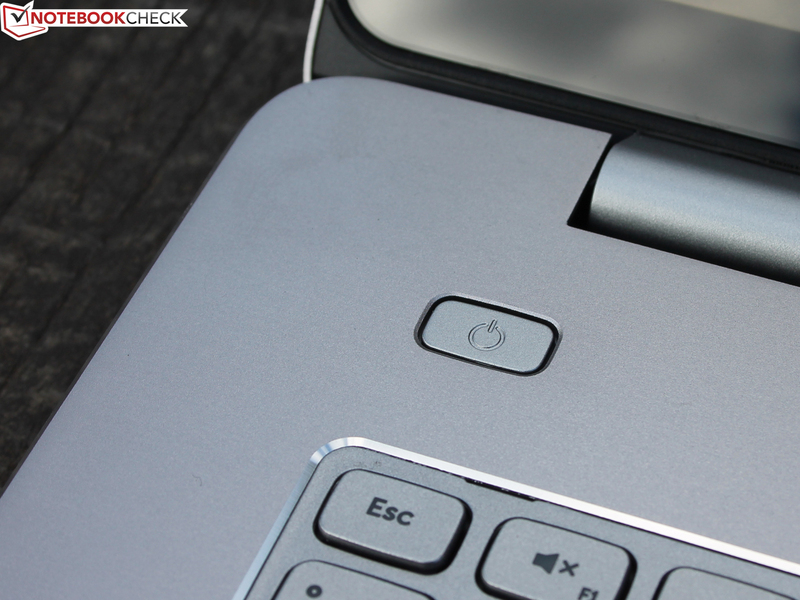 Still, users with high expectations of stability will be disappointed: A MacBook's or Asus Zenbook Unibody's resistance to twisting is missing from the Dell; even though the base is made from a single piece of metal (a plastic underside with hinge reduces firmness and stability). On the part of the Full HD panel, the 7737 offers rich color and brightness, and it is well armed with wide viewing angles. Still, it does not achieve the quality of an IPS panel, which is built into its sister model, the 7537. Anyway, the competition does not have the perfect display up their sleeves either (TN, except for the Aspire V7). Users looking for an eye-catching design should consider the Asus N750. 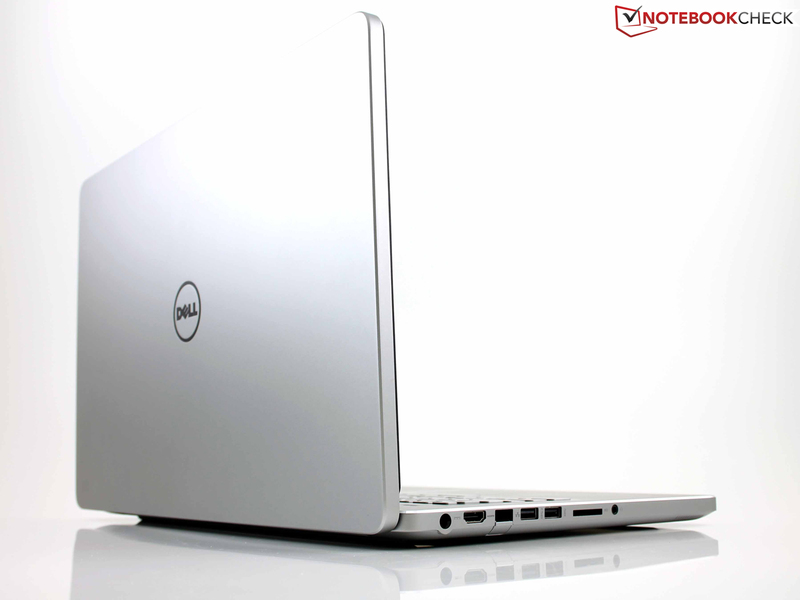 It is a bit more expensive, but it boasts both excellent stability in its base and a speedier Standard Voltage Core i7. The Toshiba speeds along on the same 45-Watt processor, though we did not really warm to its less impressive chassis. The CPU performance scores are certainly noticeable, which is why performance geeks should cast another quiet look at the cheaper Satellite. Acer's V7 is a possibility, if users are looking for a flat chassis with access to the underside. 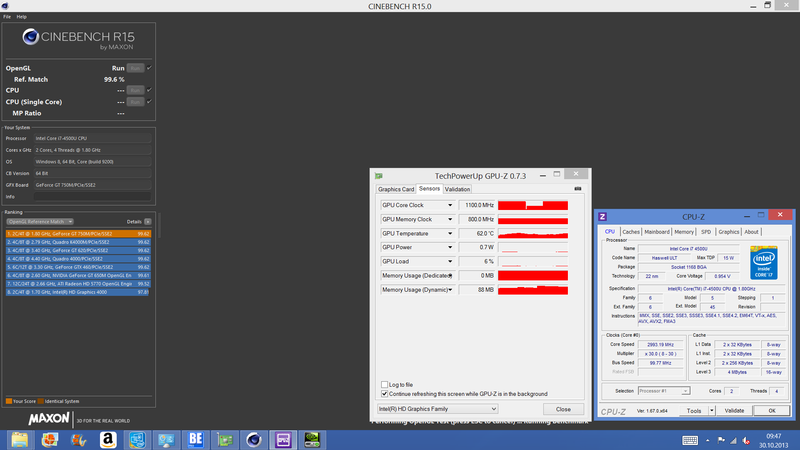 Still, the CPU performance of our test product lags behind the competition because of an overzealous turbo throttling. Those who swear by optimal picture quality should forgo a bit of contrast and go for either the Asus N750 (non-touch, matte) or the Aspire-V7-582PG (touch, IPS). The latter is (depending on configuration) also cheaper than the Inspiron 7737. 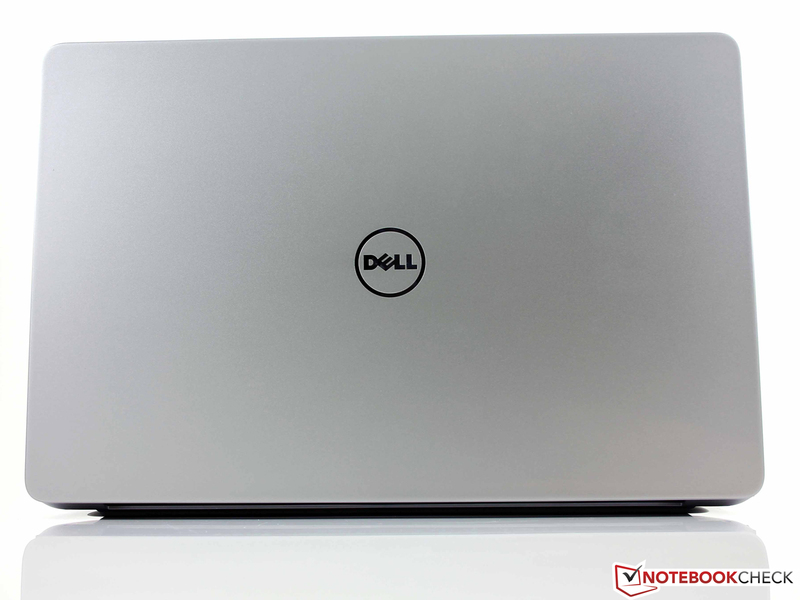 Dell Inspiron 7000-series - 7737 CN77304: Cuts an optically excellent figure and uses the full computing power of its components. ...includes 14-, 15- and 17-inch models. 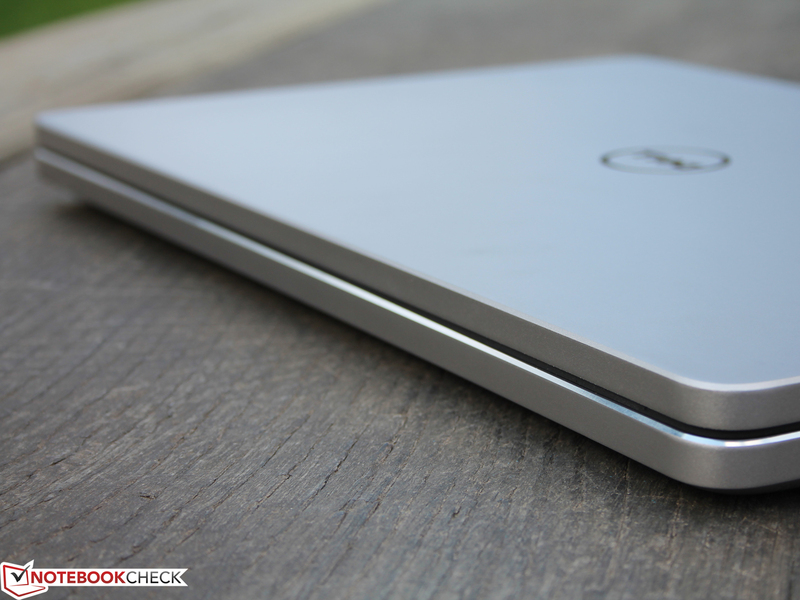 For our last critique, we examined the 15-inch Inspiron. 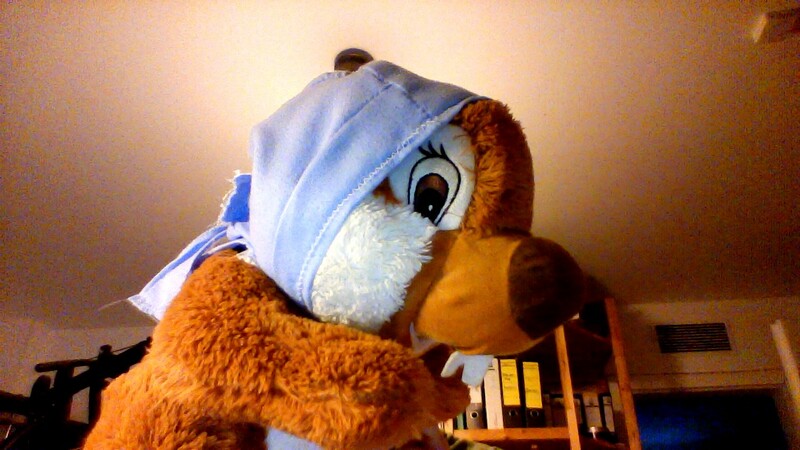 ...is based on an entirely new case construction. 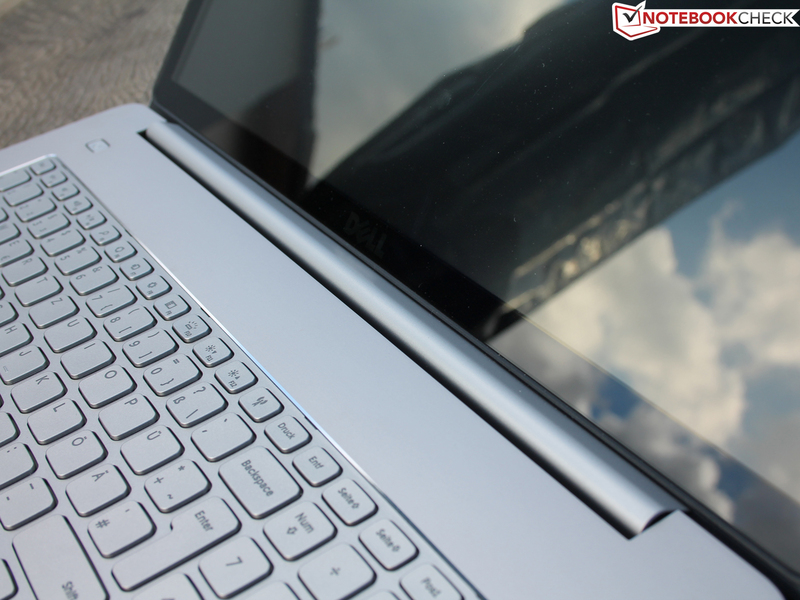 With the exception of the bottom panel, the entire notebook is constructed from aluminum. Wide legs make for a secure stance. The 7737 seems to be made from a single seamless piece of metal. However, buyers must tote around 3.3 kilos, plus power cord. But owners can pride themselves every day on immaculate workmanship. Still, the construction's stability leaves something to be desired. ...will be slightly disappointed, at least in this: the base twists noticeably during handling. ...and the well-constructed input devices certainly have appeal. The lid is also constructed from one piece of aluminum. ...but still not 100% secure. This is the natural consequence of its 17-inch dimensions. Noticeable: Just as with the earlier Inspiron generation, Dell forgoes a D-Sub-VGA port. ...switched out, just like the hard drive and the memory. ...must loosen screws under the keyboard. Access to the fan is also located there. Pressurized air can be pumped through here. Step two: the screw joints are prized from the plastic underside. With the help of a joint leveler, this can be freed from its little latch mechanism. All in all, a workable way to the interior, but not the easiest. Here we see the speakers. 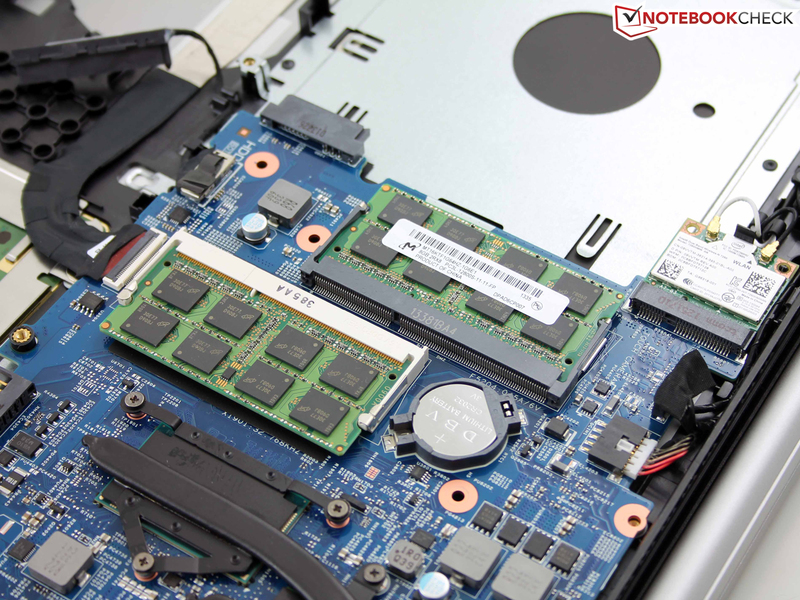 RAM modules occupy the two available sockets. The WLAN module has two antennae. Despite the high power drain of 90 W, the power cord is quite portable and weighs only 400 grams (0.9 lbs.). Why it has to have such glossy surfaces, not even Dell can explain. The power cord is just 22 mm high. The power socket has an indicator LED. 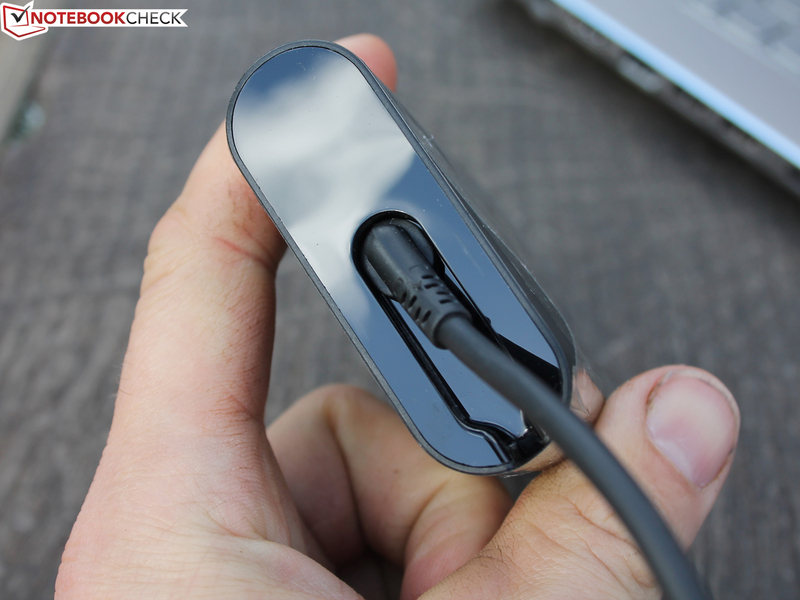 It shines in contact with the power outlet or smolders in standby mode. The constrast-rich Full HD panel is one of the strengths of the Inspiron 7737. 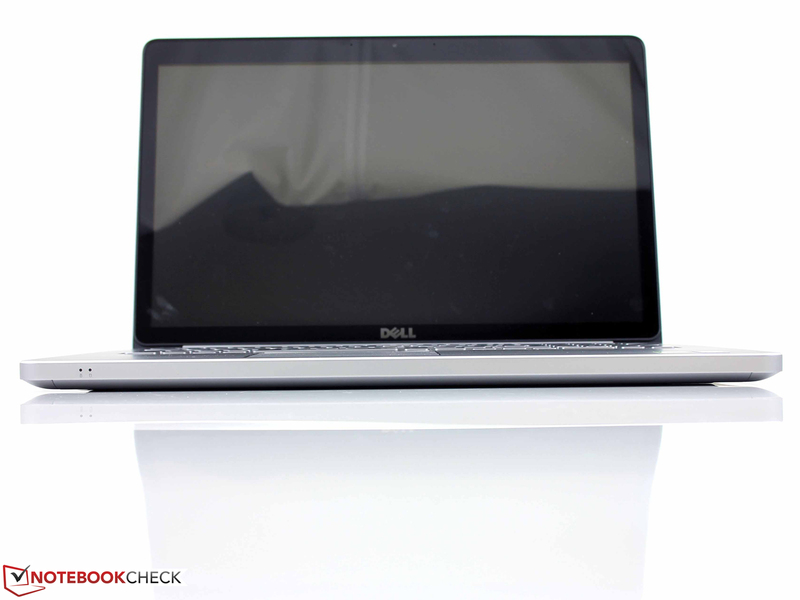 Dell Inspiron 7000-series 7737 CN77304: no IPS, but in terms of viewing angles, a very good TN panel. 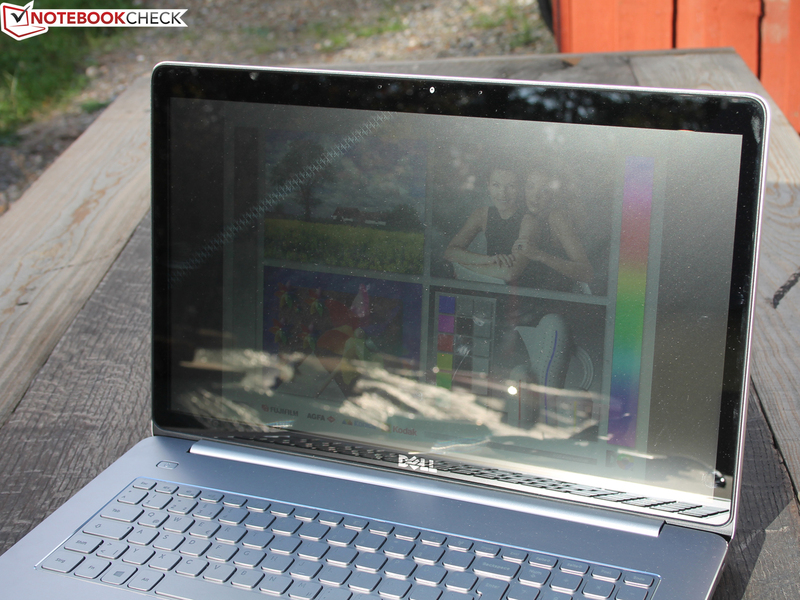 Dell Inspiron 7000-series 7737 CN77304: The touchpad causes problems outside with strong reflections. The high brightness helps only a little. Outstanding! 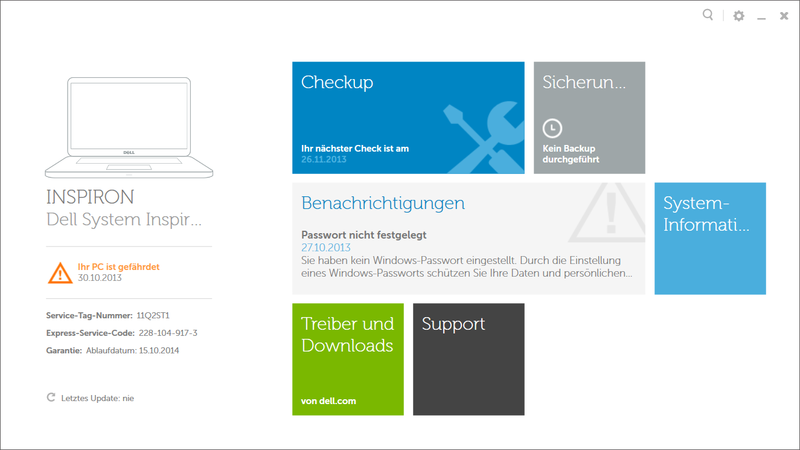 The Inspiron 7737 surfs web sites over WLAN for 6 hours, 25 minutes. Wobbly: the plastic underside doesn't match the otherwise high standard of workmanship. Full GPU Turbo, even on battery. A high-class TN panel: Usable viewing angles, high contrast and strong brightness go hand in hand. If you're going to use such a heavy aluminum, then do it right and include a flawless, twist-resistant base. The 15-inch sister product has a better handle on this. The battery is integrated but can be taken out easily. This concession costs the 7737 valuable stability. Why the gaming performance is sometimes far below where it should be, we can't explain.